Here we go. I've been sparsely working on this map for more than a year now, and it's finally done! This was the map I first started working on. As you move from Peloponnesos and mainland Greece to Anatolia, to Thessalia and Makedonia, across the Ionian sea to Sicily and Italy, you will see the styles of territories changing as I progress from a noob to a somewhat competent mapmaker. Review by Zephyrum on 6/30/2017. This map is what made Apollo my favorite greek. 5/5 would take him to a dungeon to tie him down for 2 hours while explaining him why I love this map. Review by A_B3 on 7/20/2017. Review by Den-Sel on 9/24/2017. Bad map. 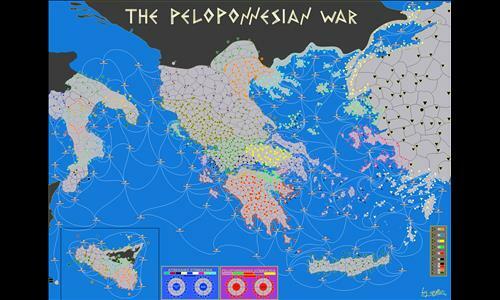 There is a lot of deviation from historical place names and no link to the historical strategy of the Peloponnesian War. Re practical things, there are too many territories, too many connections. Bonuses are unclear to incomprehensible. The font is so small that you have to zoom all the way in and then you can't figure out the bonuses. Without a manual, I find this unplayable. 1 out of 7 people found this review helpful.